You will be given medication through a vein to make you relaxed and sleepy, and your throat may be sprayed with local anesthetic. 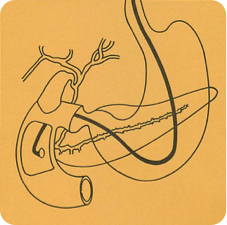 While you are lying in a comfortable position on an X ray table, the ERCP endoscope will be inserted through the mouth and into the duodenum. During the procedure, while X-rays are being taken, you may be asked to change your position. The tube will not interfere with your breathing. Gagging is usually prevented by the medication. During the procedure, you may feel bloated due to the air used to inflate the intestine. An X ray contrast material is injected into the ducts, you may feel some discomfort. You will be observed in the endoscopic area until most ofthe effects ofthe medication have worn off. You may feel bloated and might have a soft bowel movement because of the air and contrast material that were introduced during the examination. You will be able to resume your diet after the procedure unless you are instructed otherwise. Are there any complications from ERCP? ERCP is safe and is associated with very low risk when performed by physicians who have been specially trained and are experienced in this highly specialized procedure. Complications can occur but a re uncommon. One possible complication is pancreatitis due to irritation of the pancreatic ducts by the Xray contrast material. Another possible complication is infection. Localized irritation of the vein may occur at the site of medication injection. A tender lump develops which may remain for several weeks to several months but goes away eventually. Other less common risks include perforation (tear) of the bowel, drug reactions, and com plications from unrelated diseases such as heart attack or stroke. Death is extremely rare, but remains a remote possibility. What are the reasons for doing ERCP? ERCP is a valuable tool for the diagnosis of many diseases of the pancreas, bile ducts, liver and gallbladder. An abnormality suspected by clinical history, blood tests or X ray can be con firmed and studied in detail. The cause of an obstruction to the flow of bile may be found in a patient who is jaundiced. The diagnosis may be made in a patient who is not jaundiced when symptoms suggest disease of the bile ducts or gallbladder. If a blocked duct is found, surgery may be required without delay. In patients with suspected or known pancreatic disease, ERCP will help to determine the need for surgery and the best type of surgical procedure to be performed. ERCP is a safe and extremely worthwhile procedure which is well tolerated. The decision to perform this procedure was based upon assessment of your particular problem. If you have any questions about your need for ERCP, do not hesitate to speak to your doctor, who will also be happy to discuss the cost of the procedure, method of billing, and insurance coverage. Both of you share a common goal—your good health—and it can only be achieved through mutual trust, respect and understanding. It has been decided after careful medical assessment that ERCP (endoscopic retrograde cholangiopan creatography) is necessary for further evaluation and treatment of your condition. ERCP is a highly sophisticated technique, requiring special endoscopic training, and can be accomplished successfully in a high percentage of patients. This brochure has been prepared to help you understand the procedure. A long flexible tube, slightly thinner than a pen, is passed through the mouth and back of the throat into the duodenum (the first portion of the small intestine). The opening from the bile duct and pancreatic duct into the duodenum is identified. A small plastic tube (cannula) is then passed through the endoscope into this opening and directed into the bile duct and/or pancreatic duct. Contrast material (dye) is then injected and X rays are taken to study the ducts. For the best possible examination, the stomach must be completely empty, so you should have nothing to eat or drink, including water, from 11 P.M. the evening before the examination or for at least six hours before its performance. Your doctor will be more specific about the time to begin fasting, depending on the time of day your ERCP is scheduled. Be sure to let your doctor know if you are allergic to any drugs or have had an allergic reaction to iodine dyes. A companion must accompany you to the examination because you will be given medication to help you relax. It will make you drowsy, so you will need someone to take you home. You will not be allowed to drive after the procedure. Even though you may not feel tired, your judgment and reflexes may not be normal. It is important that your doctor know if you have had any barium X rays in the past week, as barium may interfere with this test. Please bring your X-rays with you, as they may be important.